#1 Trust the State to establish standards for safe drivers. We were brought up to trust police officers and firefighters. They were our neighbors, my mom use to tell me that if I got lost or was in trouble to look for a police officer – they could help us. I guess a lot of that trust was transferred to other branches of government and, despite all the skepticism and disagreements folks have today about our government, I still believe that we live in the best country in the world. Unfortunately, once a “system” is in place in our society, it is not easy to change. It’s like trying to turn the Queen Mary on a dime – not gonna happen! The requirements for getting a driver license, for drivers education courses and their off-shoots seem to fall into one of those “systems”. What happens when our 15 or 16 year old starts bugging us about getting license? We try to put them off, but we also start checking out what the process is. We remember what is was like when we got our license (that scary trooper sitting there with his clipboard and gun – what a test of nerves that was). But, we passed, got our license and we were walking tall (even if we did get lousy picture on our license – do they train people to take pictures that way, say “duh” and flash!). Well, things can’t have changed that much…have they? In some ways, at least the ways that matter, getting a driver license is still not that much of a challenge. You take a course, get a certificate, pass a driving test, and you’re on your way. Despite all the evidence that traditional driver education has failed to produce safer drivers and, in spite of the greater risk young drivers face as new drives, the process has not changed much. Why? Good question. Probably a lot of factors – parents and teens often don’t think beyond what’s most convenient, cheap, or what the school they attend provides. Many simply assume that all schools and programs are the same – after all, they all meet state minimum standards. Understand that the state officials who get paid to establish these standards do not get paid for producing safer drivers. There is no built in accountability – no reward, no punishment. They get paid for meeting their job description and not rocking the boat. Isn’t your precious daughter important to you? Of course, she is. You didn’t invest the last 16 years of your life simply to lose her in a stupid, preventable car crash. So maybe trusting the state’s minimum requirements for licensing is not such a good idea. Maybe you want to investigate a little, do some poking around, look for a course that has some built-in accountability, find someone who’s willing to guarantee their work. That’s not too much to ask, is it? If you pay for it, no matter how little the fee, you’ve done your job, right? Can you really trust a driving school (public or private)? Do they require anything other than the state minimum? Does the student get credit for putting in their time or does he have to completely master all the skills before they get their certificate? Do they even answer the phone? Ask them what curriculum they use? Is there anything unique about their curriculum? Ask them what the collision-rate is of their graduates? How many times have the driving school cars been in collisions? They fall into the same trap. What trap is that? The trap that comes from having a course that is “time-based” versus one that is “mastery-based”. If you’re reading this, chances are pretty good that you truly care about your son, your daughter. You may be willing to go the extra mile to give her opportunities like ballet lessons, piano lessons, join the scouts or your local soccer league. My wife, Frances, got the boys into summer camps for computing, tennis lessons, swimming, gymnastics, dance, scouts…anything they showed an interest in she was willing to give them a shot. For her, no sacrifice was too great that she couldn’t find a way. She’d help them do almost anything, if they truly wanted it. Caring is extremely important. But, it’s not enough. If you don’t have the right tools for the job, it’s tough to do the job correctly or to know how to measure if you are doing the task correctly. Getting the tools can make all the difference in the world. Today’s driving environment – it’s crazy! You don’t have to be a genius to realize that almost anyone can get a driver license today. Haven’t you seen some idiot on the road zip by you going 35 mph OVER the speed limit, jump into another lane and then stop on the shoulder of the freeway so he can back up and get to the exit ramp he missed? Crazy, isn’t it? And we’re just talking about what’s on the road. According to the National Highway Transportation Safety Administration there are more than 1,700 fatalities and 840,000 injuries yearly due to vehicle crashes off public highways. “How did he ever get a license? Of course, some drivers eat their Fruit Loops while they’re driving (and texting!!). Crazy drivers abound – you don’t need me to tell you that. Well, you can’t put the genie back into the bottle, so you need figure out a way to handle this. I’ve talked with a lot of moms and dads who thought 25 would be the age when they thought their girl might be okay to start driving. I know the feeling. But they are growing up and sooner than you want, you’re going to have an empty bedroom in the house. Yes, it happens to all of us…time waits for no one. So what is the best use of your time and what is the best way to choose a drivers education course that’s practical, thorough and can give you peace of mind. Of course, I’m going to tell you that the answer to your prayers is Driver Ed in a Box®. Hey, if you want more information about why that is true, how tens of thousands of smart parents, parents like you, have made that choice you can go to our product description section, read and hear all sorts of great testimonials from our customers, and get a clearer picture of how Driver Ed in a Box® works and why we guarantee your son/daughter drives their first year collision-free. Driving today is nothing like it was when we started driving -. there are more drivers, more vehicles, more types of vehicles, and more distracting elements with wireless communication devices galore, vehicles with unintended acceleration, and what seems like recalls every week. Some things never change. At least, it seems that way. The church bells in our neighborhood still ring at noon and on the hour and my wife still won’t darn socks (but that’s another topic). Let’s get back on point. The formula for driver education (5 hours of classroom for every 1 hour of behind-the-wheel training) was adopted in 1949 without any empirical evidence or testing. It sounded like a good idea at the time, it fit the high school schedule at the time. No one objected to it. Voila! Accepted. And, even though every (yes every) valid study of driver education has demonstrated that this standard has FAILED to reduce accidents (really, I prefer the word “collisions” because these are not “accidents” – I mean it’s not like this is an act of God). I kid you not, folks. People want to believe drivers education is beneficial. Some even think it’s a sin just to point out its massive failure. But the facts are not in dispute. Driver education has failed, and it has failed miserably. Isn’t that amazing! Yes, it certainly is. Is that some kind of a record or what? Here we have requirement that seems logical. It makes sense to most anyone that if you are going to give someone a lethal weapon (a 3,000 pound machine with the potential of easily doing speeds of 50, 60 or 70 miles per hour) that you want the operator of that weapon to have some training, some experience, some judgment, and certainly proof of minimum qualifications before you give him the keys and turn him loose. Hey, isn’t that already done. Sort of. Yes, both state and federal agencies have established guidelines for driver education. Schools and instructors are licensed and regulated and supposedly trained in the most current techniques for teaching driving safety. But guess what, both the federal and state agencies still follow that old, outdated, never-proven (unless you count the proof of its failure to produce safer drivers) formula from 1949 – yes, that’s the 5 hours of class for every 1 hour of behind-the-wheel training. And, in Texas, some public school and driving schools give more classroom and less on-road training- wow. Talk about watering down standards – it’s amazing what some schools will do just to “herd ‘em in and get ‘em out”. Hey, I’m not some radical telling you this because I advocate doing away with training and licensing requirements. Just the opposite. But I think we’ve got to recognize when something’s broken and invest in fixing it – even if that means doing something a few people might consider radically different. Mom & Dad…the Problem or the Solution To Drivers Education? Back in the 60’s when I was a teenager (yes, I once was a teenager), there was a bumper sticker that read “If you’re not part of the Solution, you’re part of the Problem”. I don’t think it was ever as popular as my favorite Texas bumper sticker “Secede!”, but it did make a point. Mom and Dad (parents) have enough on their plate and teaching their teen drivers education was probably not what they envisioned when they tied the knot. But, faster than a speeding bullet, the day arrived when their little girl (who by now is NOT a little girl) began asking when she could start driving. The fact is, most parents don’t want to teach their kids – that’s why they send them to schools. But the fact is, almost all kids are receiving parent taught drivers education already. That’s right, mom and dad, whether you know it or not, by the time your young one is thinking “Hey, one day I can do this”, guess who their watching –YOU. Have you reached the stage yet where you have an “aha” moment and realize “I sound just like my mom!” Okay, maybe it’s not an “aha” moment, more like an “uh, oh…” moment. You know what I mean. 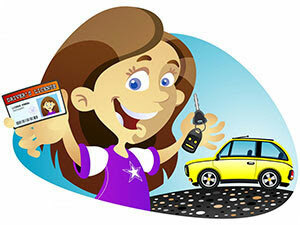 The fact is, whether you are teaching your teen to drive. The question is “What are you teaching them?” Hey, you are an experienced driver, you have a wealth of knowledge and experience that your new teen wanna be driver could benefit. The problem is that you’ve been driving for years and you don’t think about how to drive, you just do it. And that’s normal – most driving is done at the “other than conscious level”. When a part of you recognizes that something’s amiss in the traffic scene, it alerts you to pay more attention and you handle it. You’re already involved. In fact, most every state now requires that mom or dad supervise their new teen driver for anywhere from six months to a year. Why? Because they know that they sure didn’t get everything they needed from a driver education course at school. So, it’s really your choice, you can guess what you’re supposed to do and cross your fingers or you can get Driver Ed in a Box® with its guarantee and get all the tools to make the job fun, easy and effective. Yes, that’s right, you either choose to be part of the problem…or part of the solution. The New York Times ran an article stating that the Mayo Clinic had surveyed the five biggest fears of parents. What do you think they were? What are you biggest fears as a parent? Did any of those hit home? Say, when I think about any one of those things, I admit that I could get concerned. “Dangerous strangers” – I get chills imagining the unknown. Which one is the scariest for you? Guess what is not on the list? Motor vehicle crashes. Wow. Even though motor vehicle crashes is the number one killer of teens, it did not even make the top five when parents revealed their fears. That’s scary. Your son or daughter is more likely to be seriously injured or killed in a motor vehicle crash than all of those other things combined. But motor vehicle crashes is not even on your radar. How do you explain that? I don’t know. Maybe it’s because we kill and injure so many teens (over 340,000 seriously injured last year according to the Center for Disease Control), that as a society we simply don’t even notice it. Except when it’s your son or your daughter, then you can’t help but pay attention. Drivers education has been around for over three generations and it still has failed to produce safer drivers. During all that time, motor vehicle crashes has remained the number one killer of teens. But, no one seems to notice what a poor job it does. It’s something we accept and don’t think about – like the Forgotten Killer.